When it comes to purchasing outdoor furniture in New Zealand, it’s important to understand what you are actually buying. It is easier than ever before to import furniture. As a result, there is an abundance of low quality lookalikes available at ‘bargain’ prices. Whilst it might look great on the shop floor, this is not necessarily how the furniture will look in the coming months and years. We live in an environment that features extreme levels of UV, temperature fluctuations and rapidly changing weather conditions. 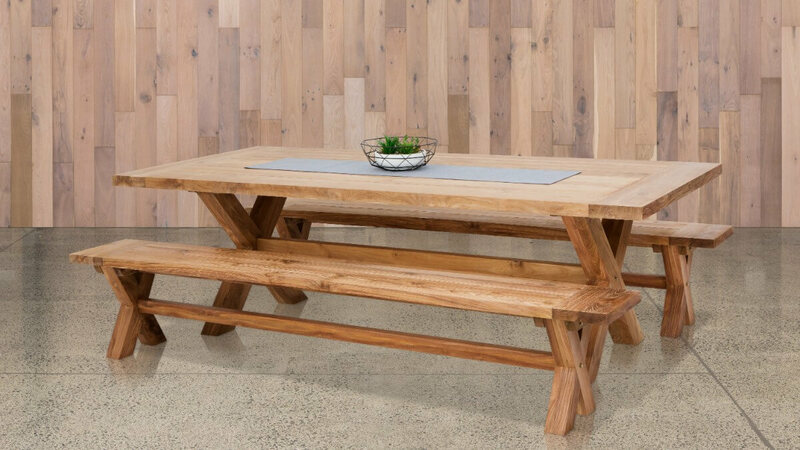 A large proportion of the furniture imported into New Zealand is made for overseas climates, and simply does not stand up to our harsh environment. So what should you look for when purchasing outdoor furniture? Outdoor furniture framing needs to be able to withstand the elements. If you live near the beach, you will also need to consider the effects of salt spray. Aluminium, stainless steel and wood are the most popular framing materials. Aluminium is one of the best materials as it is light, durable, easy to work with and isn’t susceptible to rusting. Modern houses tend to use aluminium for window frames and joinery due to its ability to withstand rough conditions. Stainless steel is much harder than aluminium, contains chromium for protection against degradation and offers a polished finish. However, not all types of stainless steel are the same. We use marine-grade stainless steel in some of our framing to ensure that anything continues to look good for many years to come – regardless of where in the country you live. If you decide to go for a wooden frame, avoid using softwoods like pine, as they have a tendency to warp over time. Teak is the best hardwood for use in furniture, as it doesn’t bleed, has minimal movement and thrives in harsh conditions. We aim to use teak over other woods where possible – this way, your furniture will continue to perform well and look great for many years to come. If you are purchasing an outdoor sofa or chairs with elements of fabric, selecting the right material is critical. Most materials produced overseas aren’t made to withstand the New Zealand sun. To the untrained eye, it is hard to tell the difference between quality fabric and cheaper alternatives. Brands like Sunbrella and Sunproof are made to last, which is why we use these materials in all of our collections. Foam an important component that people often overlook when buying outdoor furniture. Sure, aesthetics and durability are vital, but what’s the point in buying a sofa if it’s not comfortable to sit in? Reticulated quick dry foam is the best option in outdoor settings, as it doesn’t absorb moisture. This means that if you have a heavy downpour, the cushions can be dry and ready to use within 15 minutes. You can leave furniture with quick dry foam outside throughout the year and make the most of sunny moments without needing to worry about getting wet pants. Buying well-made furniture is an investment that provides value for many years to come. We are committed to supplying affordable, high quality furniture that fits in with the latest design trends. We’re based in Auckland – however, we can ship products nationwide. To learn more about the most important considerations when selecting the right outdoor furniture, feel free to get in touch, visit our showroom at 18 Barrys Point Road, Takapuna or take a tour of our virtual showroom.